When contractors are looking for a product homeowners can’t refuse, they look to Clean Mesh® and Screen Mesh® from Southeastern Metals™. 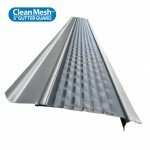 Screen Mesh and Clean Mesh gutter protection products feature an offset louver system that has been specially engineered to draw rainwater into the gutter trough, while preventing outside debris from entering. The Convex Screen Design readily sheds leaves and debris to keep gutters free-flowing and eliminate the hassles created by clogs, and is even effective against small debris such as pine needles, seed pods and shingle grit. It should be noted that Screen Mesh and Clean Mesh are installed differently to accommodate different roof styles. While Screen Mesh is designed to install under the first row of shingles, Clean Mesh is installed right up against the fascia. These different installation methods make Screen Mesh and Clean Mesh a perfect fit for any type of new or existing roof. Finish selections for Screen Mesh include Mill Finish, Brown, Bronze, Charcoal or White. Clean Mesh is available in Mill Finish, Black, Brown or White. Together, Screen Mesh and Clean Mesh offer a tough, easy-installing solution to meet the maintenance demands of every contractor and building owner. Let these products help you get a handle on the heaviest rains while stopping leaves and debris from clogging gutters. For more information and to order Screen Mesh or Clean Mesh, give our Customer Service Department a call at (800) 874-0335.